On December 5 of Tensho 17 (1589), the reconstruction of the sanmon (main gate) at Daitoku-ji temple was completed with Rikyu's financial support, and on December 8 Rikyu held the 50th anniversary memorial service for his father Ichu Ryosen. In the same way as the officiating priests, Shunoku Soen and Kokei Sochin, Rikyu had a close relationship with Daitoku-ji. The life of Rikyu, who won fame as a close associate of Hideyoshi and as Japan's greatest tea master, ironically came to end through a confrontation with Hideyoshi. Various explanations of his enforced ritual suicide have been put forward. 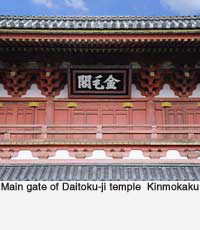 The incident of a wooden statue of Rikyu being placed in the sanmon gate is well known, but there is no way of knowing the real reason. However, the recently discoverd memorandum written by the 4th generation Iemoto Koshin Sosa contains the following profoundly interesting extract, 'The one-and-a-half mat room designed by Rikyu was not to Hideyoshi's liking, so he changed it to a two mat room. He made the wall outside the tea garden white and planted pine trees but this too was not to Hideyoshi's liking, so he had it altered. He put a sign board above the gate but this was not to his liking either, so he took it down. From this time onwards, Rikyu's originality was accepted less and less by Hideyoshi.' This was written a long time after Rikyu's death, but it shows us that the basic cause of their confrontation was the difference in their way of thinking about chanoyu. Anyway, Rikyu's enforced suicide symbolizes the discords that emerge from the gaps between the arts and authority. On January 24 of Tensho 19 (1591), Rikyu invited Tokugawa Ieyasu to a tea gathering. This the last record of Rikyu at a tea gathering. On February 13 Hideyoshi's order of Rikyu's banishment to Sakai was issued and Rikyu was placed under house arrest in Sakai. The story has come down to us of his leading disciples Furuta Oribe and Hosokawa Sansai going to see him off at Yodo when he boarded a ship for Osaka. Recalled to Kyoto for his ritual suicide, Rikyu wrote his final poem on February 25, facing his death on the 28th. In stormy weather, amidst peals of thunder and falling hail Rikyu ended his life of seventy years at his Juraku residence.